Far from its origins on the banks of the Mississippi River, this unassuming house, built in 1841, has managed to be a newsmaker since one of its early inhabitants became famous. 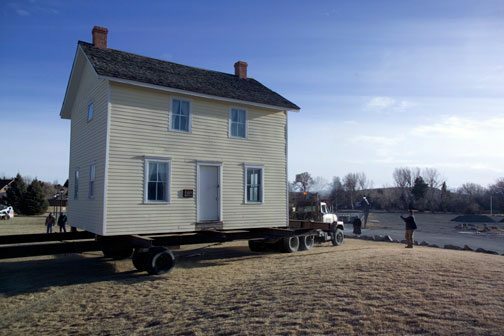 The Boyhood Home of William F. “Buffalo Bill” Cody has moved twice in its more than 170-year history. 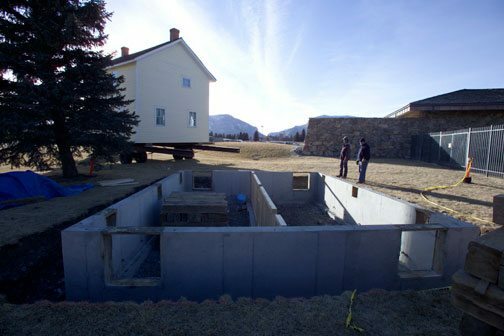 It is now enclosed in the Buffalo Bill Center of the West’s Cashman Greever Garden—just outside the recently redesigned and renovated Buffalo Bill Museum. Probably the oldest building in Wyoming, it also seems to be the most-traveled structure in the state. 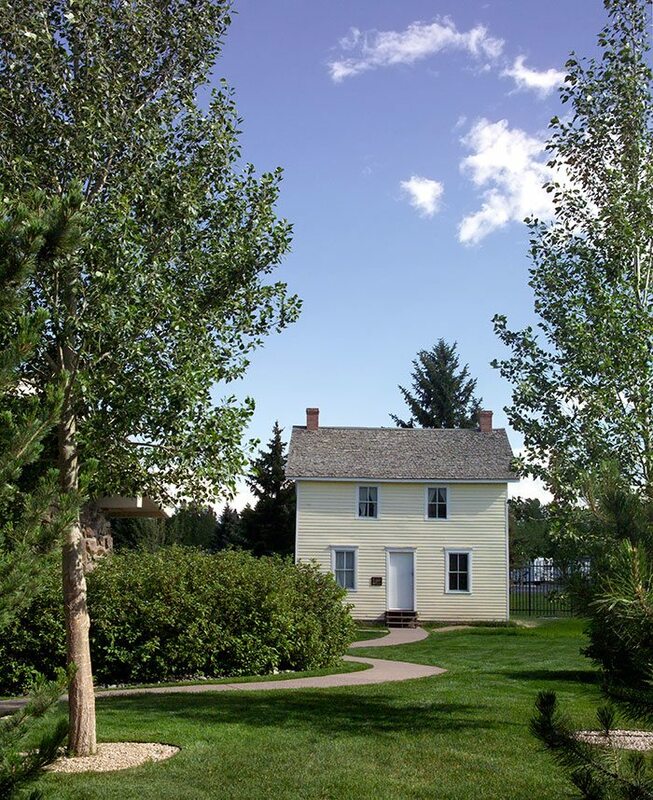 Buffalo Bill’s Boyhood Home was placed on the National Register of Historic Places in 1975. 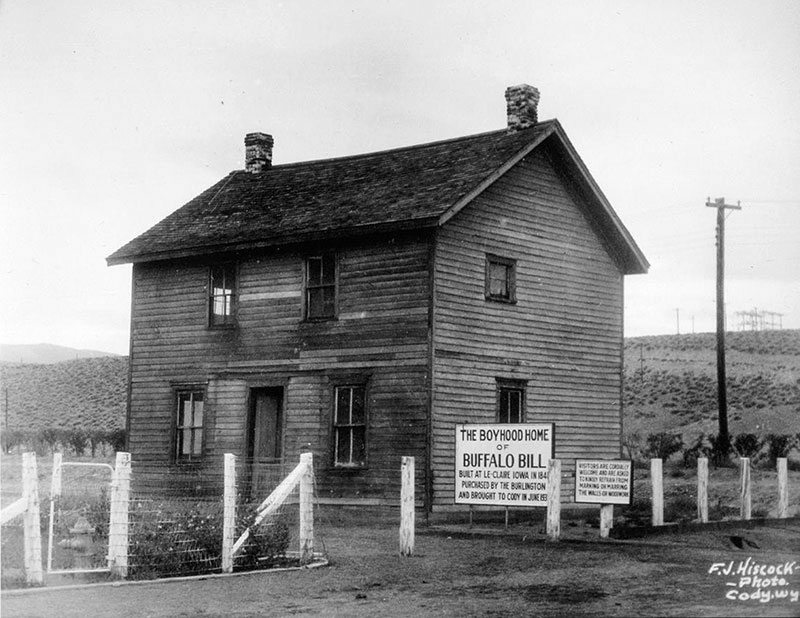 Buffalo Bill’s Boyhood Home was a typical town house on the agricultural frontier, and is an example of folk or vernacular architecture. It was built according to the memory and skills of the carpenter, so no written plans were used. 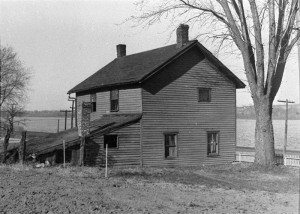 The house was built of sawed lumber with hand-hewn beams and corner posts. The walls have hand-split oak lathe covered with a homemade plaster of lime, sand, and cement. The floorboards were evened with an adze, and additional smoothing would be done with hand planes. The outside of the house was covered with pine clapboard. The building is rectangular in shape, approximately 25 feet long, 18 feet wide, and 20 feet high at the gable peak. A “lean-to” kitchen was attached to the back of the house, but was not moved from its original Iowa location. In the upstairs were two or three bedrooms; on the ground floor were two multi-purpose rooms, divided according to use. One portion of the downstairs was used for eating, washing, and dirtier chores, such as candle making. The other side served as the parlor, which was not only a place to entertain visitors, but was also a “living” room, a “family” room, and a “work” room. Here Mrs. Cody and the oldest daughters would spin wool or flax, sew quilts and clothing, and do the mending while the younger children worked on school lessons, played, or napped. The family slept in two or three rooms on the second story of the house. These were heated by warm stove pipes running up to the chimney on the roof. 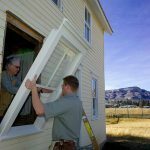 But how did this old house find its way to Cody? As early as the 1880s and continuing beyond the end of World War II, Yellowstone National Park was one of the great focal points for open-booking railroad tours. There were two Yellowstone entrances accessible by rail. The Northern Pacific Railroad serviced the park’s northern entrance in Montana, and the Chicago Burlington and Quincy Railroad (the Burlington) serviced the east entrance at Cody. Between these two railheads, the Yellowstone Park Company offered tours of the park. They owned the hotels, camps, and a fleet of stagecoaches—later motor buses—that accommodated the tourists moving from one entrance to the other. The tours varied from 10 to 14 days under horse power, three to five days under motor power. These tours peaked in popularity in the 1920s and 1930s. In those decades it was not unusual for 40 to 80 or more of the Park Company’s yellow-painted, folding-top touring buses to travel in convoy along the gravel-surfaced roads. Dusty and rough going—but the tourists loved it! Naturally, these sightseeing tours could only operate during daylight hours, which resulted in a problem for the Burlington’s passenger agents at their railhead in Cody. Each evening, a tour came out of Yellowstone and unloaded anywhere from 500 to 800 hot or cold, dusty or muddy, tired or lively tourists. Each morning, a starting tour loaded into the same buses and headed for the park. Whether the railroad operated a morning train or an evening train, either group had to spend the night in Cody—a place with more comforts and freedom than Pullman and dining cars could provide. Museum curator Mary Jester Allen warns the house movers not to bump into the museum’s sign, 1948. Complicating these circumstances was the fact that the Burlington had never actually built into the town of Cody. The depot was a bit over a mile north and across the Shoshone River from Cody’s hotels, restaurants, and shops. Both the town and the depot were located on the second terrace above the river, so the road between was a series of two long downhill grades and two long uphill grades regardless of direction of travel—a fact that discouraged tourists from making evening strolls into town. The railroad’s answer to this problem was to build a hotel, named the Burlington Inn, alongside their depot. This was said to be a good hotel possessing a large lobby, dining room, and several enclosed shops. Still many of the tourists were restless in the evenings, but a diverting trip into Cody involved either the formidable walk or an expensive taxi ride. Therefore, the Burlington Inn was always on the lookout for ways to interest their guests. 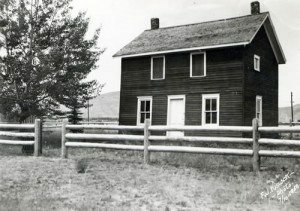 Boyhood home, July 10, 1950, on the grounds of the first Buffalo Bill Museum. The state of Iowa was Chicago Burlington and Quincy Railroad territory. 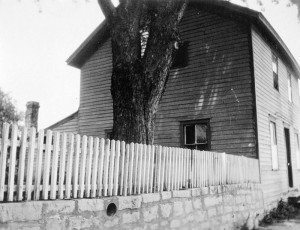 In 1933, the railroad learned that Buffalo Bill’s Boyhood Home in LeClaire could be obtained; they bought the building and moved it 1,200 miles west to Cody, placing it adjacent to the Burlington Inn. The depot tourists now had a bit of entertainment available to them. By 1947, with the rise of private automobile tours, organized railroad tours to Yellowstone National Park were fading away, and the railroad was ready to tear down its Burlington Inn. The Chicago Burlington and Quincy gave the Isaac Cody home to the Buffalo Bill Memorial Association in 1948. 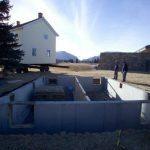 The then 106-year-old structure was ready for its second move—down the two long hills, across the Shoshone River, back up two more long hills—and placed on a new foundation alongside the Association’s 20-year-old Buffalo Bill Museum, a distance of a few miles. In 1969, when the Memorial Association sold its Buffalo Bill Museum building and land and moved its museum displays across the street into the new [then named] Buffalo Bill Historical Center, the old Boyhood Home was moved for a third time. In 1970, completely refurbished, the 129-year-old house was opened for display at a new setting a few yards to the south of the Center. 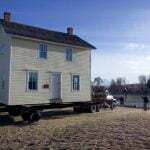 In 2004, the house was moved for a fourth time to the Greever Garden inside the Center grounds where its landscape would soon resemble Iowa—minus the Mississippi River—and again be preserved for future generations to enjoy. 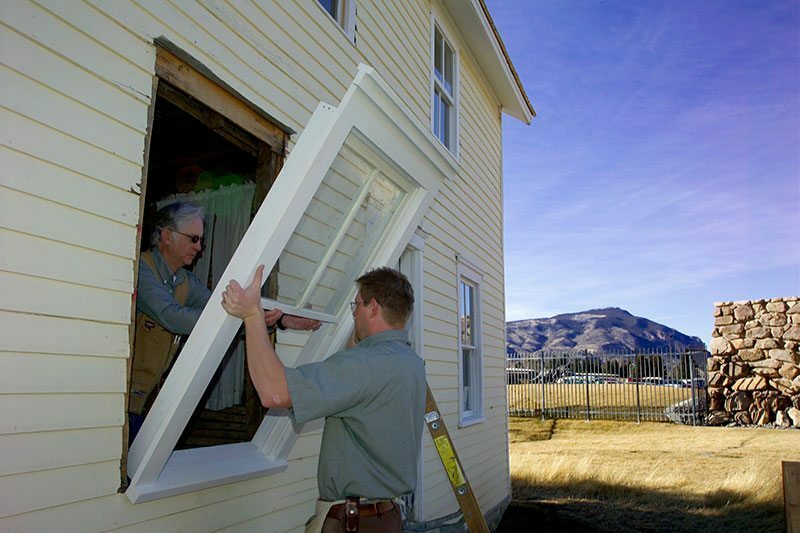 The exterior of the Boyhood Home has been completely restored. 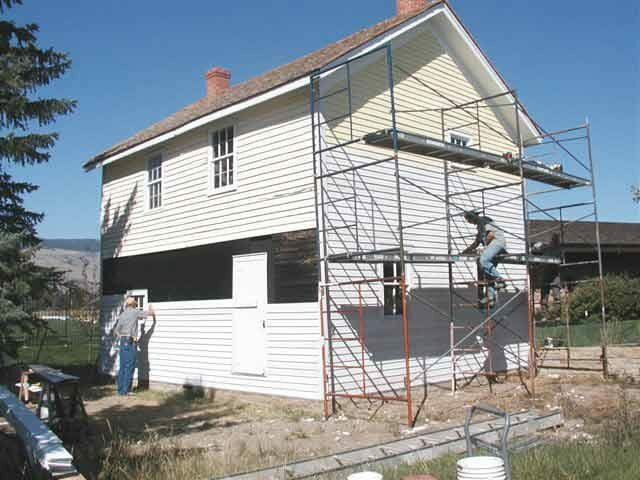 During summer 2005, Center carpenters Larry Quick and Matt Bree restored the siding on the house. The lumber used is an exact copy of the original nineteenth-century siding, ordered from a mill in Montana. The carpenters went over the boards one by one, leaving the good ones intact, repairing those that were repairable, and replacing any that had rotted. 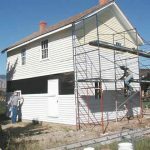 Center finishing specialist Pat Ankrom painted each side of the little house as it was completed, using the original colors as determined by the 1980s FBI paint test. In the third image from the bottom (to the right) you may notice the bright yellow on the upper portion of the right hand side of the house. The upper area of the back portion is the faded yellow, which is difficult to decipher from the new white planks. 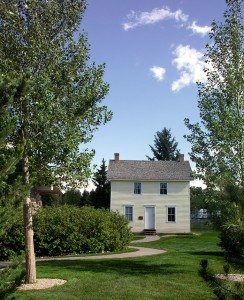 The last image shows Buffalo Bill’s Boyhood Home looking bright, sturdy, and seemingly content, in its new Greever Garden setting. The next step in the restoration process is the development and implementation of a historical interior furnishing plan. National Registry of Historic Places Nomination Form (February 6, 1974). Prepared by Ned Frost, Chief, Historic Division, Wyoming Recreation Commission.